Where the real goods happen is when Monaghan and Fessenden are on screen together. They pair up very well and play off each other so well that one cannot help but imagine that with stronger material this sort of horror comedy routine could have been comparable with great duos like Abbott and Costello whose comedy monster films are the stuff of legend. And while McQuaid's script does have its inspiring moments I found it fairly predictable, which is a shame. Crap, it was like I was prophetic and could predict which jokes and gags were coming thus quelling their comedic impact. I'm not saying McQuaid was following the rules of British comedy but there was little that I didn't see coming. This absence of original comedy was disappointing. What could have been the reinventing of the buddy film, immersing it in the blood and shock of horror cinema, played out fairly flat a lot of the time. As far as the horror elements of the story are concerned they are centered around some of the stronger comedic moments of the film and do provide the bigger laughs. And there were some great laugh loud moments. When the tag line says, Never trust a corpse, McQuaid's script does provide excellent reasons for second guessing a career in grave robbing. 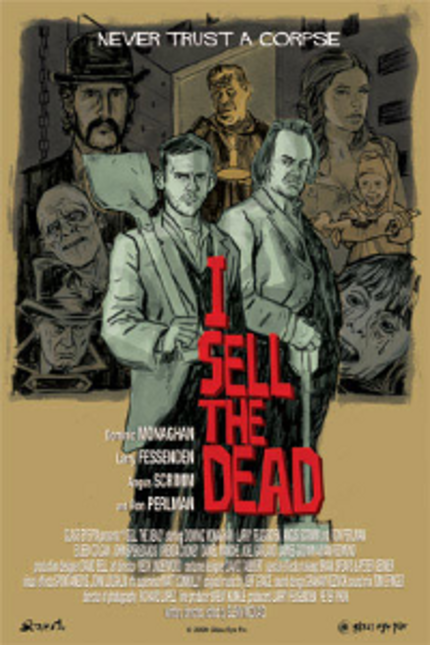 But I Sell The Dead is not without strong horror scenes and a good amount of blood letting. Neat. Makeup and special effects are mostly good and McQuaid does dress up a pretty set, converting New York into 19th century England complete with taverns and funeral parlors. Production and art direction are not weak points in this film, everything looks great. Acting was very solid in this picture. I just wanted a tad more OOMPH to things. I dug the E.C. Comics Tales from the Crypt vibe to the whole thing. I liked this a whole lot. Its big weakness though is a pretty big one. There isn't a goal that the film is moving towards reaching at the end, and because of it, there were a couple times in the last third where I was wanting to know how many unconnected stories were going to be told before wrapping things up. Again though, I liked it a lot. It was fun, the performances were great all around, and although the Digibeta that was screened looked pretty cruddy, you could tell that it looks really great for a low budget period piece.